Gardening is a sensual experience and while secondary to sight, our sense of smell nonetheless adds a complementary and vivid way in which to interact with our garden treasures. Most of us grow at least one well-known fragrant plant but there is a world of aromatic pleasures beyond roses, lavender, and wisteria. This article looks at five of my favorite delightfully fragrant, if lesser known, plants. In my opinion, the intoxicatingly sweet aroma of Burkwood viburnum (Viburnum ×burkwoodii) matches that of any Daphne. The species is a cross of garden origin between Viburnum carlesii and V. utile. Both parents are known for their fragrant flowers while V. utile contributes glossy leaves, heat tolerance, adaptability to high pH soils, and a profuse flowering habit. The latter plant was introduced to the trade in 1901 but has since become a collector’s plant. Burkwood viburnum grows six to eight feet tall. Domed terminal corymbs of intensely sweet, tiny white flowers appear in mid to late spring against handsome, dark green, glossy, ovate leaves. The plant is mostly evergreen in USDA zones 10 and 11 and deciduous in colder climates. 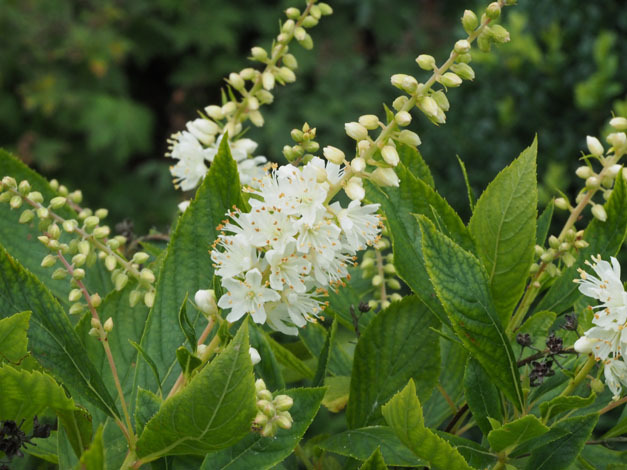 Tough like most viburnums, V. ×burkwoodii is the perfect shrub to place along a pathway where its heady aroma can be enjoyed throughout its bloom season. 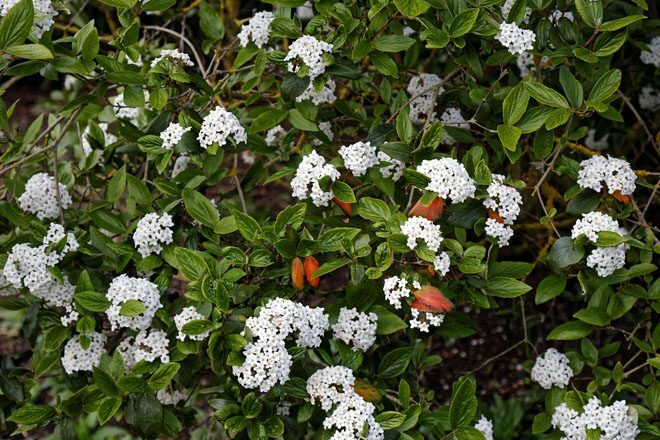 The common name of this relatively unknown shrub says it all. Summersweet (Clethra alnifolia) is native to the East Coast, from as far north as Nova Scotia down to northern Florida. This deciduous shrub earns its keep by producing exceptionally pretty white or pink fuzzy flowers in terminal racemes in midsummer. A prolific bloomer, the five-inch-long flower spires are a delight to bumblebees and smell like sassafras, making it one of the most uniquely evocative fragrances in your garden. Its other common name, sweet pepperbush, owes to the tiny black fruits (seedpods) that resemble peppercorns. Adding to its allure, the foliage turns golden in the autumn. Summersweet varies from three to eight feet tall and prefers partial shade and regular water. My plant receives morning sun and flourishes in that environment. Prune twiggy growth in winter to strengthen dominant limbs. One of the best kept secrets in the arena of fragrant plants, Chilean jasmine (Mandevilla laxa) has an intensely sweet fragrance matched only by Clematis armandii ‘Snowdrift’. 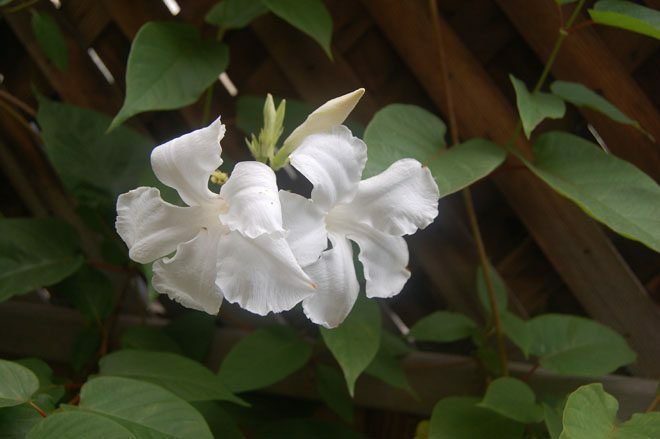 Despite its common name, Chilean jasmine hails from Argentina. The plant is hardy to 10°F, grows a modest 10 to 15 feet tall, and is ideally suited for growing up the side of a house or over an arbor. Deciduous in winter, handsome four-inch-long, dark green leaves that are wide at the base and narrow at the tip, flush out in spring. As the heat of summer arrives, long racemes of large, pure white flowers appear. While sometimes compared to sweetly fragrant gardenia blooms, Chilean jasmine has a distinctive sweetness all its own. Late-in-the-day heat intensifies the fragrance, making Chilean jasmine an excellent addition to a terrace or deck where you pass the evening hours. Pairs of bean-like pods follow the flowers and the plant is sometimes referred to as the vanilla bean vine. Curiously, this hardy vine features a succulent subterranean caudex. Having a species from a well-known genus on this list of “lesser-known” plants may seem odd, but then Salvia melissodora is no ordinary salvia. Its pale violet colored flowers emit a strong, unmistakably grape scent, delighting kids and adults alike. Despite its dainty, one-inch grayish green leaves and slender branches, this plant is tougher than it looks. For this sage, it’s all about the flowers; a nonstop parade of two-lipped Salvia greggii-like flowers begin blooming in early spring and continue all the way through to the first frost. Hummingbirds, butterflies, and especially bees adore the flowers. Melissa is the Greek word for honeybee and, according to Greek mythology, Melissa was a nymph who discovered and taught the use of honey. The association stretches back even further to female societies that viewed bees, honey, and hexagonal honeycombs as the ideal representation of nature. 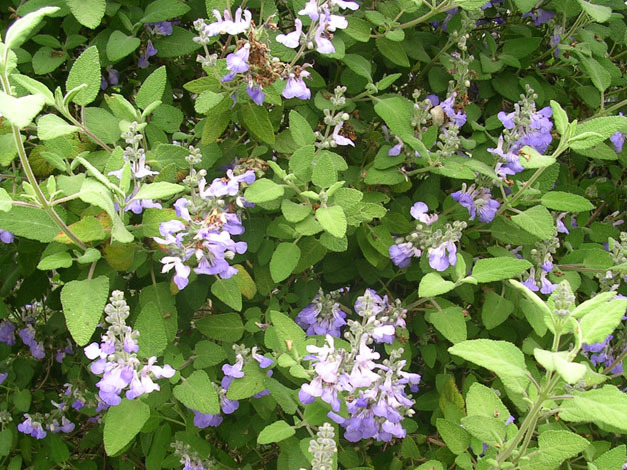 Associations aside, you’ll want this delightful sage in your garden for its ever-blooming habit and fragrance. 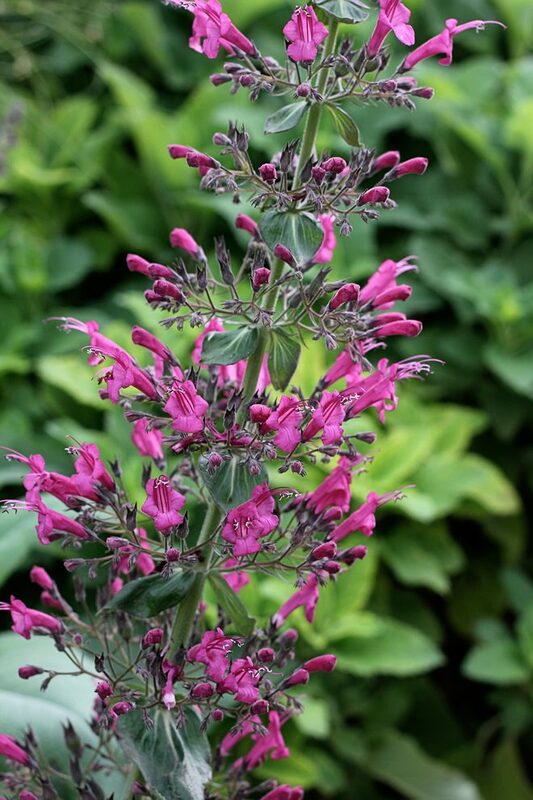 This Salvia relative may be as close to a perfect plant as exists in the world of gardening. Easy and fast growing, pitcher sage, (Lepechinia hastata) quickly fills out to a robust 8 to 10 feet tall by 6 feet wide. Though the heavy crop of gorgeous burgundy blooms is a big selling point, it’s actually the large, arrow-shaped, felted leaves that are the source of this long-lived perennial’s intoxicating scent. Some say sweet, some say woodsy, while others say minty; whatever your association, I rate it as one of the most pleasing fragrances in the garden. Native to Baja and northern Mexico, pitcher sage is hardy to 0°F and it can also take heat. Spikes of magenta flowers appear in early summer and continue deep into the fall. Plants benefit from light pruning and new growth sprouts almost immediately. As a lover of fragrant plants, I try to mix in some where the flowers are the source and others where the leaves provide a variety of pleasing scents. Lepechinia is a great source of the latter.